PSEG COURTESY PHOTO Roadways where traffic delays could occur during the next month as work progresses on the cable project underway to ensure long-term power reliability to Shelter Island. Regarding last week’s letter (“Bones to Pick”), Mr. Evangelista either misunderstood my letter or I wasn’t clear. AMBROSE CLANCY PHOTO | The Town Board work session Tuesday. From left, Councilwoman Chris Lewis, Councilman Paul Shepherd, Supervisor Jim Dougherty and Councilman Peter Reich. Councilman Ed Browne was absent. 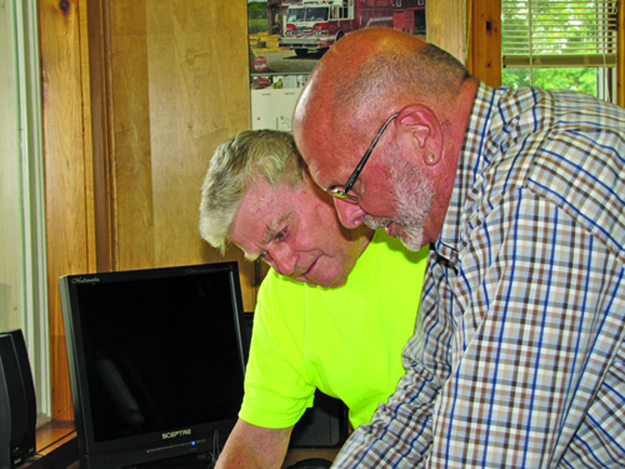 JULIE LANE PHOTO | Looking over new procedures are Shelter Island Fire Chief John D’Amato (front) and Fire District Commission Chairman Andy Steinmuller. Because of perceived, and sometimes real, friction between the fire department and the fire commissioners, Chief John D’Amato and Fire Commission Chairman Andy Steinmuller met with the Reporter last week to clear up some misconceptions. You know when a fire alarm sounds on Shelter Island, those men and women who respond are your volunteer firefighters. But who are the others you read about who sometimes seem at odds with the fire department ­— fire commissioners — who may or may not be firefighters? They seem to have a lot to say about how the department functions, but who gives them that right? That is, you do if you vote in fire district elections typically held in December. What Chief D’Amato and Chairman Andy Steinmuller want you to know is there might be differences of opinion at times, but they’re both on the same side. “It’s not an adversarial relationship,” Chief D’Amato said. But there is “push-pull” between the two because it’s up to the department’s three chiefs to request money for equipment and up to the commissioners to decide what the district can afford. Where does the money come from? Taxpayers, said Mr. Steinmuller, explaining that commissioners adopt an annual budget, a process currently under way for 2014. The district commissioners are obligated to track how money is being used and when it can be moved from one account to another. What does it cost the taxpayer annually? Surprisingly little, according to District Treasurer Amber Williams. If your house is assessed at $640,000, you’re paying $176 for fire fighting services. It’s similar to how school districts must comply with state and federal mandates affecting curriculum and procedures, but often aren’t given enough money to cover the costs of such compliance, Mr. Steinmuller said. Fire District commissioners must figure out how to juggle the tax money they receive to ensure they’re complying with mandates pertaining to training and equipment, among other expenses. If the chiefs sometimes seem frustrated in their efforts to get equipment they believe is vital to their operations, it’s not because the commissioners fail to understand the need. It’s because they simply don’t have the funds, Mr. Steinmuller said. One cause of friction concerns the federal Occupational Safety and Health Administration. When OSHA laid down requirements to protect firefighters, all agreed compliance was important. But the cost of reviewing the department’s procedures and equipment and training members in those procedures could cost $10,000 or more. When commissioners heard there might be someone local who could do the job for $500, they naturally jumped at the lower figure, but have since had problems slotting in the consultant to do the job by the December 31 deadline. Chiefs were cynical from the start that the job could be done for so little money. Now all parties are scrambling to find a way to bring the department into compliance. That’s what prompted Chief D’Amato to complain there’s not a written contract with the person who was to do OSHA training and evaluation. The days of handshake contracts are over, the chief said. By state law, when a bid is awarded, a written agreement must establish start and finish dates for each project and stipulate other elements that must be met by the winning contractor. It’s that written contract that protects both the district and the contractor’s interests, Chief D’Amato said. Mr. Steinmuller agreed that going forward, such contracts would be put in place. Another question is money the department raises from events like its Chicken Barbecue and Country Fair. Some of that may go to offsetting the costs of equipment, typically paid for by the commissioners with tax money. But mainly the money from events goes back to the community through scholarships, a program to offset the costs of heating oil, and signs needed to ensure firefighters can find houses when an alarm sounds. A tiny amount is spent to provide some meals for firefighters. By law, the district can provide only water for firefighters on the job “so we don’t die of thirst,” Chief D’Amato said. But if it’s a lengthy fire, the district can’t pay for food, so that comes out of department money — a small price to pay for the volunteers, the chief said. “We’re not a rich district here,” Mr. Steinmuller said. With the 2 percent cap on tax increases imposed by New York State, it’s hard to cover increasing expenses, he added. “Everybody in that room is a taxpayer,” Chief D’Amato said, meaning everyone wants to keep spending in check. Both the fire district and fire department have their own sets of policies. But it’s up to the commissioners to create the over-arching policies that inform how both function. “We’re constantly trying to update and stay with the current knowledge,” Chief D’Amato said about requests he and the other chiefs make to the district commissioners. “Fire service, like the rest of the world, is changing and there’s always a tug and pull between the old guard and new procedures,” he said. “John has opened up our eyes a lot of times on certain things,” Mr. Steinmuller said.